We install great solar systems for people who want to own them. Clients pay us to design and engineer systems, negotiate the permitting process, furnish equipment and materials, and install them in such a way that they’re going to generate a lot of clean, hassle-free electricity without ruining their homes. We’re really good at doing all these things. But crunching numbers, doing actuarial work, playing nicely with investors, and coming up with wordy contracts thick enough to literally stop a bullet just makes us really tired to think about. So we don’t mess with solar leases or power purchase agreements. That’s not to say these aren’t good things…we don’t train elephants either, but are grateful that someone does. We just don’t mess with tricky financial things when it comes to solar. Truth is, the best savings come from owning your own system. In case these things that we don’t do sound at all interesting, here’s a little explanation. “Solar lease” and “power purchase agreement” are often used interchangeably, but really they represent two fairly distinct aspects of a wide range of solar financing methods, or in other words, clever ways for people to get solar without having to part with tens of thousands of dollars all at once. They work for a lot of people because solar energy really is cheaper than grid energy, but they’re more expensive in the long run than simply buying a system outright. Would you rather pay $20,000 right now, or $35,000 in monthly installments over the next thirty years? That all depends on your situation, right? With a solar lease, someone installs a complete system on your roof and charges you nothing for the installation. The system immediately begins producing electricity for you, with no extra effort or added cost on your part. In exchange for this “free” energy, you pay a set amount each month for as long as the contract stipulates, just as you would with a car lease. Presumably, when the lease expires, the lessor (we call them “panel lords” around here) theoretically takes them back, but by then they’re probably worn out anyway, because the leases last a really long time. Yeah, it probably would have been cheaper to just buy the system yourself, but then you would have had to part with a big chunk of money all at once. And on the bright side, you can bet that whatever you paid for the lease was worth the savings on your energy bill. With this clever mechanism, you, the homeowner, also don’t own the system on your roof. 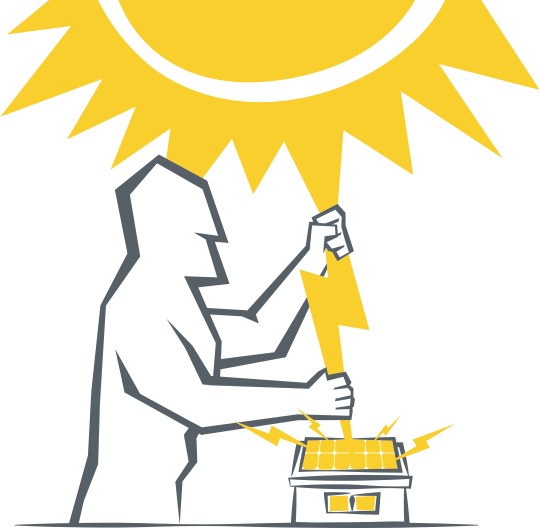 You just give your “solar utility” permission to install their generator on top of your home. Once it’s pumping useful, clean, conflict-free electrons into your fridge, TV and lava lamp, your regular energy plummets. The power you were buying from your local utility for 15¢ per kWh, you’re now buying from the folks that own the system on your roof for a little more than half the amount. It depends. With the solar lease, you pay a fixed amount each month, regardless of how much energy you use. With a power purchase agreement, you only pay for what you use. If the system underperforms your projections, you’ll wish you’d gone with the PPA. If it over-performs, you’ll wish you had the lease. But by the time you know, it will be too late. Companies are doing big business with solar financing, and we’re glad they are because it means more people have access to clean, locally-produced energy. But for anyone inclined to buy their own system, they’ll see the biggest cost savings of all. Not to mention when they say “I have solar”, they won’t mean it like they do when they say “I read War and Peace”, when they actually just listened to it on Audible.